Have you ever tired by mailing to some particular body again and again without any reply? If yes have you thought was your mail reached to their Inbox or not? And if reached, has that person read it. Most of the time the reason of no reply is either your email has not reached to the person or that person has not even opened that email. As a freelancer and Blogger I know how bad we feel when we don’t get a reply to any really important emails or receive Hey, I forgot to text you a reply. If you have encountered such scenarios like me, this is the post for you. Have you ever though there should be something which can tell you that the recipient of your mail has opened your mail and track down their activities on that mail. Sidekick is one such amazing tool by HubSpot which tracks down the activities of the recipient of your emails. Also Read: 5 Free Title Generator for Blog Posts. Actually a few days ago I sent a really important email and didn’t receive any reply so followed up a couple of times but still didn’t receive anything from their side. So, just thought whether they have opened my mails or not. And so I searched for some tool which can help me on this and finally SideKick worked amazingly. So let me tell you my experience with SideKick in the last few days. 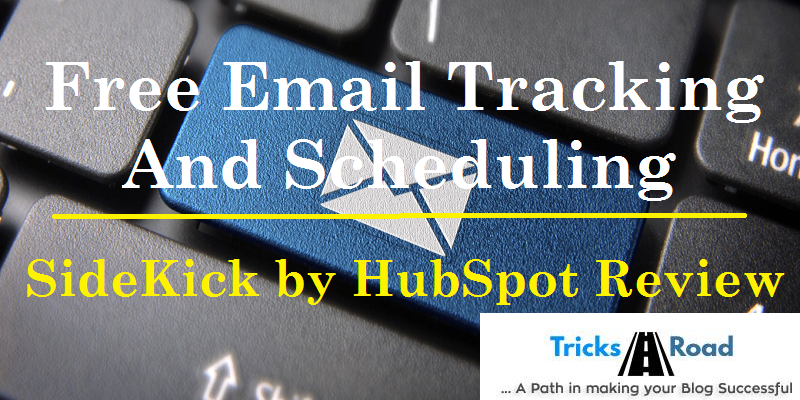 SideKick by HubSpot is a free email tracking tool. Which alert you whenever the recipient of the email opens your email when they reply etc. SideKick not only alerts you about the activities of the receiver but also using this tool you can schedule your emails for later. To get started with the SideKick, first, you need to sign up for the SideKick. You can create a free account for this. Here you can either sign up using your Google account or you can create an account using email id and password. But it’s better to Sign up using your Google Accounts as it will start tracking mails directly. Also, you can add a chrome browser extension. So those emails which you want to check the checkbox given at the bottom. So you have the freedom to track only those emails which are important and you will wait for the response. Once you have sent the email now you can view the notification on the SideKick dashboard. It will display all the mails which have been opened. Email scheduling feature is coming soon as per their website and will be available for use in the coming days. SideKick also provides free apps for the Android and iOS users. You can download those using the below link. You can use SideKick for free but the limitation is 200 emails/month. The premium version of this app costs $10 a month per user. However, you can invite your friends and can use SideKick premium for a month for free. You can register and get access to SideKick for free and then invite your friends and you will get free access to the premium account. So that’s all from my side. I am using SideKick since a week and I am very much satisfied with their features and performance. I would like to advise you too to try this. Do you use any app to track emails? If yes, please do share with me. I would be happy to give a try. If you liked the article doesn't forget to share on social media.